Jean-Michel Stephan is different! 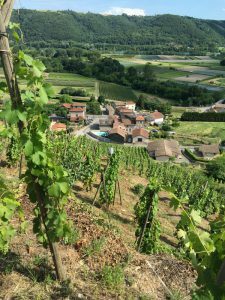 He tends his vines within sight of the iconic Guigal and Chapoutier advertising signs that dominate the steep slopes of the Côte Rôtie in the northern Rhone. 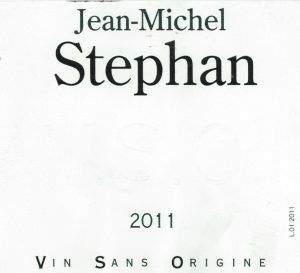 However, unlike the norm for this region of high alcohol, heavily new-oaked wines, Jean-Michel opts for lower alcohol and no new wood for his wines. Another fact that marks him as different is his love for the grape variety Sérine. This is a variant of Syrah that has smaller grapes and looser bunches. It is also more prone to disease as a variety than Syrah. However, we think that the flavour of the wine made from Sérine is superior to that of Syrah. His vineyards are on the Coteaux de Tupin and the prized Coteaux de Bassenon as well as a new plot on the plains of Condrieu right next to the Rhone. They are managed using biodynamic principles and the wines are fermented in large cylindrical steel vats. The vineyards are so steep that only 25% can be worked with a horse, the rest has to be tended manually. We can attest to the steepness as our aging bodies found it hard to keep up with Jean-Michel as he bounded up the slopes like a mountain goat! The photo below shows the terracing with just one row of vines on each terrace. Another reason why his wines taste different is that the yields are incredibly low. He achieves about 10 hectolitres per hectare which is painfully low, however it means that the vines have far fewer grapes to feed and this results in highly concentrated fruit. We think that it shows in the quality of the wine. This vintage is a mixture of Syrah, Sérine and a little Viognier. 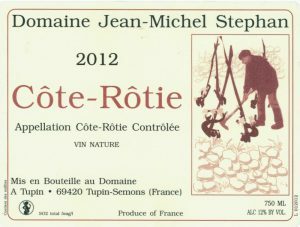 Uncommonly for the northern Rhone, Jean-Michel uses carbonic maceration for his red wines. It was matured in stainless steel tanks for a period of twelve months before bottling. 2014 was a difficult year for Jean-Michel and “so he could sleep” he added a small amount of sulphites to his wine. At a recent tasting it was drinking beautifully. It has all the notes that you expect from Syrah and Sérine such as cherries, blackberries, cinnamon, liquorice and little bursts of violets. There is also a lovely expression of minerality derived from the elements in the gneiss and granite soils in which the vines thrive. There are also very attractive silky tannins that envelop you. But it is the incredible freshness, finesse and liveliness that really stands out with this lovely wine – it is definitely a living wine and so engagingly different to some of the brutal monsters found in this region. The alcohol level is only 12%. Jean-Michel always recommends decanting his wines, and you could do this up to two hours before drinking. This wine is interesting because it was not approved by the tasting committee to carry the Côte Rôtie appellation on the label because it was deemed “atypical”, which, of course, it is! He uses carbonic maceration while fermenting the grapes, does not use new wood so beloved by the tasting panels, does not filter or fine his wines and does not add sulphur at any stage. The wine was made, as usual, from grapes picked from the steep slopes near Ampuis and Tupin-Semons (both are villages that cling to the slopes beside the mighty Rhone River) where the soils are granitic with some outcrops of gneiss. Ce vin n’a pas recu l’agreement de l’INAO, il se retrouve ainsi <<Sans Origine>> which roughly means: This wine has not received the agreement of the INAO, it finds itself as <<Without Origin>>. He therefore decided to use a little joke by giving it the name VSO which stands for Vin Sans Origine.